BB Chronological 28: BB #12 – Enter the Savage Dragon! People often ask what my favorite issue of Big Bang Comics is and I tell them that it’s too much like picking your favorite child. But the truth is that there are a few that I am extremely proudest of (issues of Big Bang that is, not children) and Big Bang #12 is one of them. 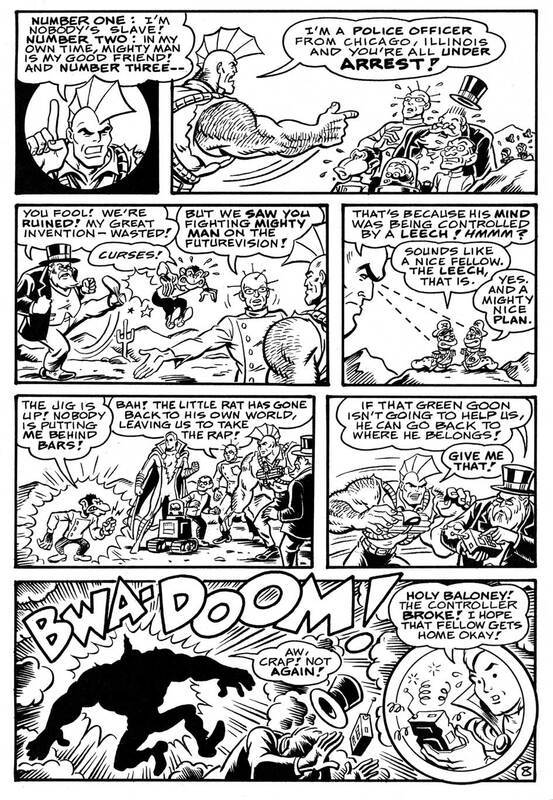 BB #12 was the first part of a three issue arc guest starring Erik Larsen’s Savage Dragon, sending old finhead on a wild trip through BB comics history. 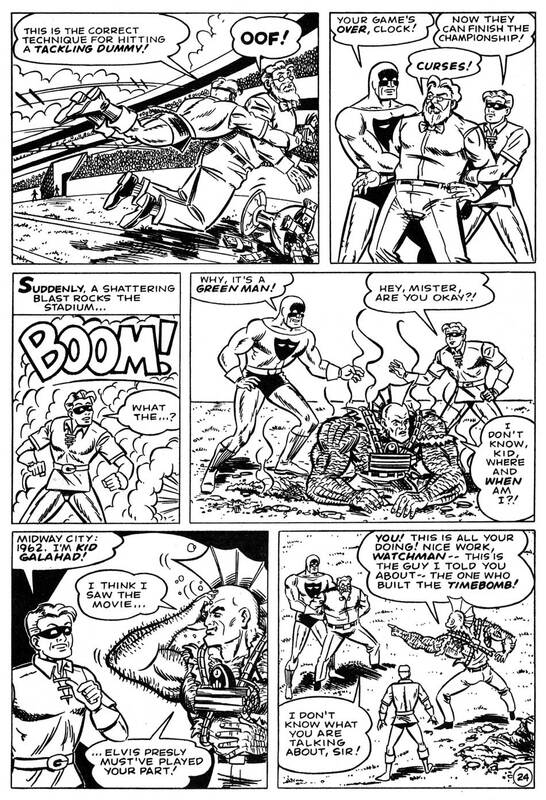 Erik was (and is) a good friend from my Megaton Comics days and I’ve always loved his work. It was gratifying that he liked Big Bang and was instrumental in taking us to Image Comics. It was even nicer that he let us play with his characters. The story continued in #s 14 & 18 and featured a Who’s Who of the top BB artists: Bill Fugate, Jeff Weigel, Chris Ecker, Dave Zimmermann, Mark Lewis, John Thompson, Joe Cooper, Darren Goodhart , Shawn Van Briesen and many more, not to mention covers by Rich Buckler and Dave Cockrum on the later issues. It also gave me a chance introduce the Pantheon of Heroes, my homage to DC’s Legion of Super Heroes, showcasing four different eras of the team. 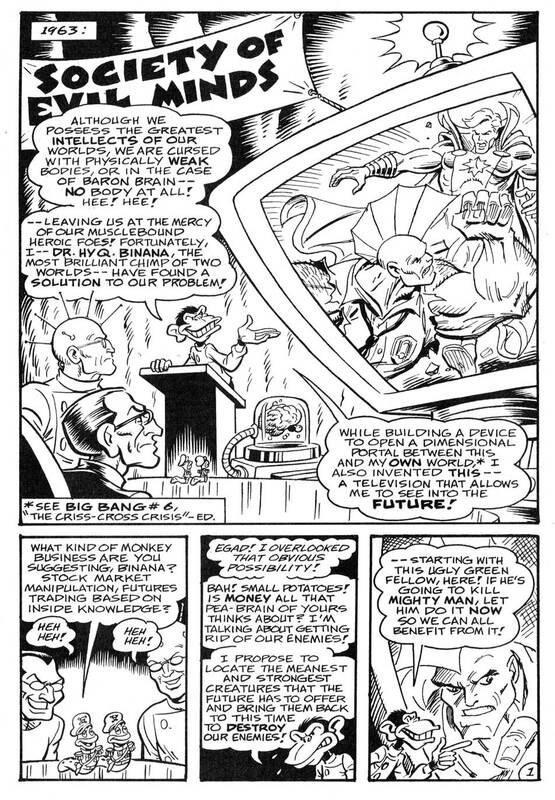 The cover to Big Bang #12 was penciled and inked by David Zimmermann, except for the Dragon who was penciled and inked by Erik Larsen. The cover and logo were homages to the Justice League, and to this day I get the biggest kick out of the Blitz’s “spit take” as Dragon appears. It pains me to say that it didn’t occur to me to ask if Erik would like to do the same on the following two covers, or even contribute to the modern sections of the story. Sorry Erik. I just didn’t want to bother such a busy guy. Years later, we were talking about reprinting the whole thing as a trade paperback and Erik was thinking about redrawing the Dragon on every page! 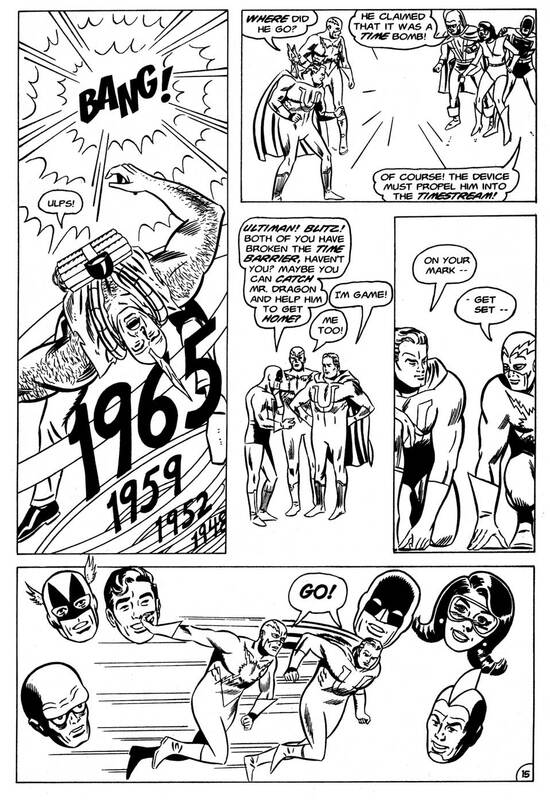 The story opens at a meeting of The Society of Evil Minds – Dr. Binana, Cortex, Baron Brain, Grandfather Clock, the Wicked Worms, Dr. Nirvana – as they plot to use an invention of Grandfather Clock’s to collect monsters from across time to defeat their enemies – starting with Mighty Man – in 1963. 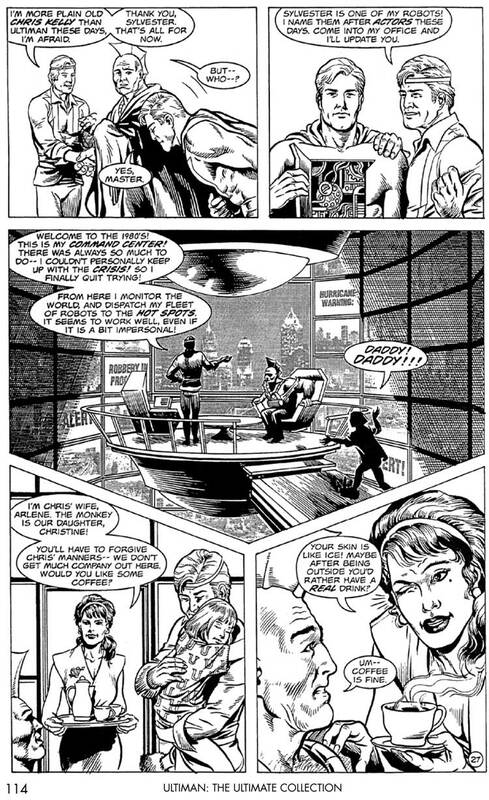 Binana’s own invention lets them see a newscast of the Savage Dragon defeating Mighty Man in 1997, so they send the invention to bring Dragon back to their time in 1963. Cut to 1997 where Dragon is battling Mighty Man, who is under the control of Horde, (the future version of Mr. Mind). Dragon has nearly defeated MM/Horde when a bomb appears out of thin air. Dragon leaps to cover and/or dismantle it but it blows up, sending him through time. Back to 1963 where the Society of Evil Minds is waiting for him and orders him to kill Mighty Man. Dragon tells them that he’s a cop and they’re all under arrest. Grandfather Clock uses the controller to send Dragon back to where he came from – but the controller is damaged by the blast, sending Dragon on a journey through time and Big Bang Comics history. 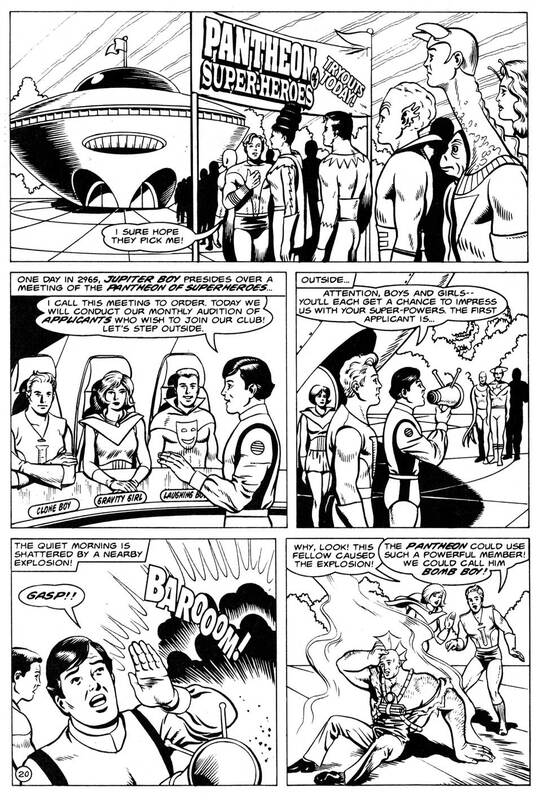 Dragon reappears in 1965 where The Round Table of America – Ultiman, Mr. Martian, Blitz, Atomic Sub, Hummingbird, Beacon, Knight Watchman and Mike Merlin help him stop a dam from collapsing. Dragon attempts to beat up Mr. Martian (because Mars Attacked Earth and Image Comics in 1996). The bomb goes off again, sending Dragon on his way. Ultiman and Blitz pursue him through the time stream but lose him. Dragon’s arrival in 1945 causes a house fire. 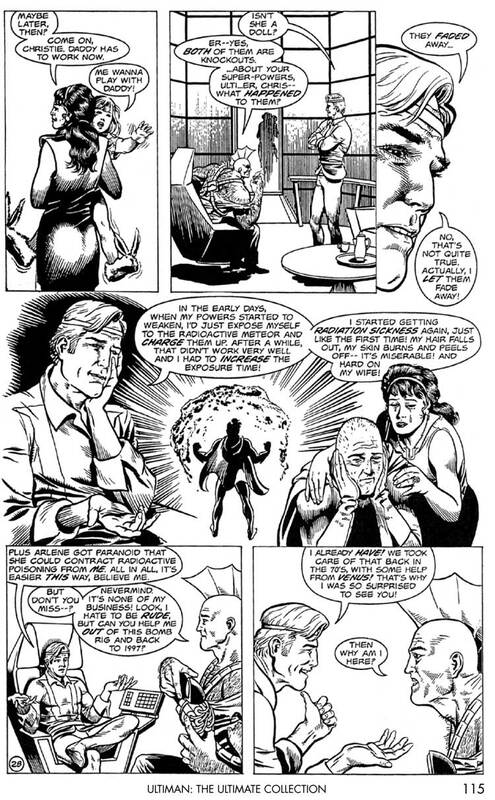 Dr Weird arrives, takes notes on the timebomb and attempts to go with Dragon to the future to find eternal peace, but time traveller Simon Ward is repulsed: he must serve his time in the past. Now Dragon ends up in the future, 2965 where he briefly interrupts a cattle call of heroes trying to join the Pantheon of Heroes. He is rejected because the bomb is a mechanical device and members must have super powers of their own. – sending Dragon to 1972, where Dr. Weird & Knight Watchman are waiting for him. It seems that Dragon’s journey through history is weakening the time stream and they want to prevent a catastrophic event. They break into Grandfather Clock’s place to try to find a controller for the bomb. There they find two Grandfather Clocks – both in shock after running into each other. They ship one Clock back to his own time and take the other to the hospital, and send Dragon on his way back to the day after he was trapped by the timebomb so he won’t run into himself. And that was it for Big Bang #12. It was a 32 page comic with b&w interiors and was published by Image Comics in 1997. While it feels like the story was more or less complete, we knew that it would continue if BB #14. 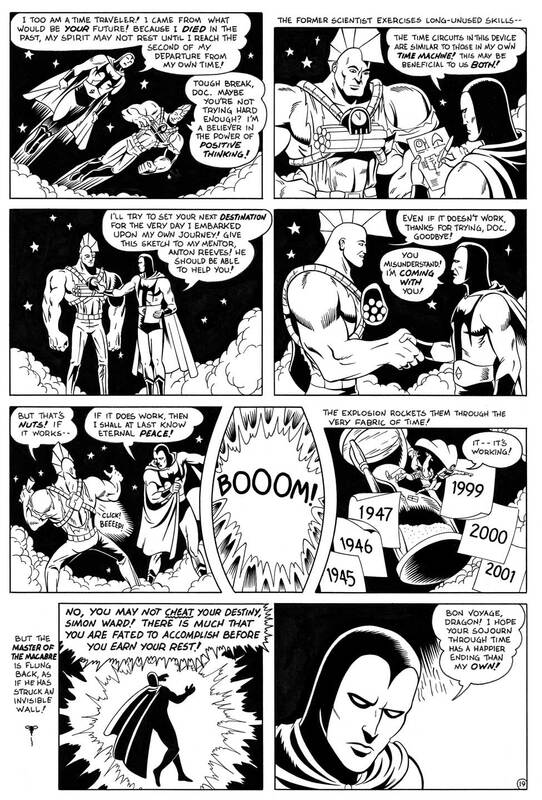 Big Bang Comics and all related characters are © and TM Gary S. Carlson and Chris Ecker. Dr. Weird is © and TM Gary S. Carlson and Edward DeGeorge. 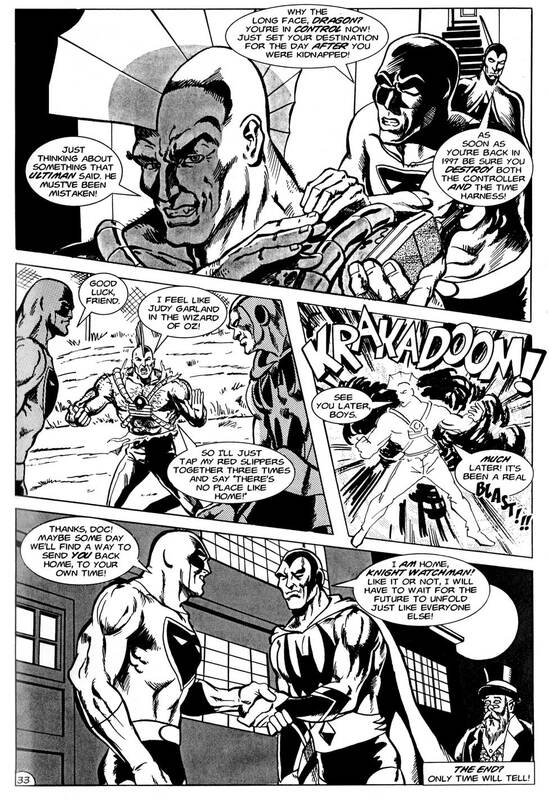 Savage Dragon and all related characters are © and TM Erik Larsen.